Get your message across using your hands and your body language Want to communicate with the Deaf community but are mystified how to start? With American Sign Language Demystified you'll learn this unique visual language, and a whole new world of communication will be opened to you. At your own pace, you will learn basic grammar structures, discover the nuances of body positioning, master how to convey time, and build a useful vocabulary of signs and phrases. 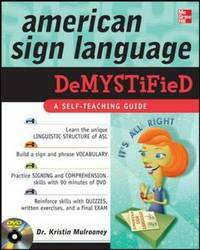 To help you on your way, the accompanying 100-minute DVD features in-depth demonstrations of how to make signs and create phrases and sentences as executed in American Sign Language. This fast and easy guide offers: A DVD that contains all the signs and phrases in the book as well as hundreds of additional vocabulary signs Quizzes at the end of each chapter to monitor your progress Etiquette you need to know when using ASL A helpful history of ASL Simple enough for a beginner but challenging enough for a more advanced student, American Sign Language Demystified will help you communicate in ASL confidently and comfortably. Kristin Mulrooney, Ph.D. is an assistant professor of linguistics at Gallaudet University, the world's only liberal arts university for the Deaf. Dr. Mulrooney's research interest is focused on the relationship between language theory and language use. Her research has focused on the structure of personal narratives in ASL, the role of metaphor in ASL discourse structure and the comparison of ASL narrative structure and narrative structure of spoken languages.